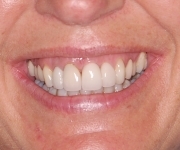 This lady had a post-crowned tooth for many years but this eventually failed because of a fracture of the root of the tooth. 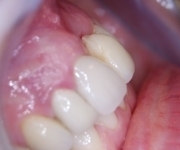 The tooth has been removed and this image shows a bridge with a less than ideal margin. The profile shows that early bone loss has already occurred. 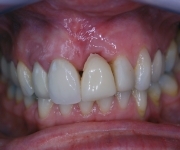 The area was restored with a single implant with bone grafting to give this final result with no denture, preservation of bone and no additional damage or risk to adjacent teeth by the provision of a conventional bridge.